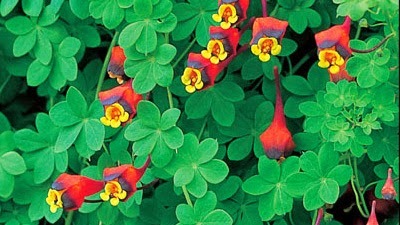 Tropaeolum, commonly known as nasturtium, is a genus of roughly 80 species of annual and perennial herbaceous flowering plants. It was named by Carl Linnaeus in his book Species Plantarum, and is the only genus in the family Tropaeolaceae. 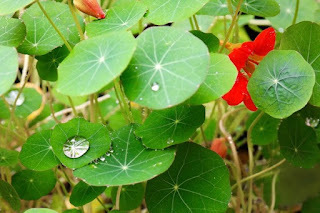 Wikipedia says both the buds and seeds of the nasturtium plant are edible and commonly pickles yielding a flavour and texture similar to capers. Not sure where wiki gets its capers from but mine taste much better than nastursium seeds! Web Administrator: The following post first appeared on our website as the Flower of the Month in February 2016. This also has the link to a blog titled DNA REBOOT where the recipe for the pickled seedpods can be found if you want to give it a go. 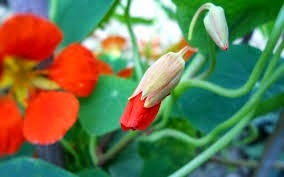 Also on that link are some rather nice images of Nasturtiums. Let No-one Cast Aspersions at Beautiful Nasturtiums! Although they can be vigorous to a fault, swathes of colourful nasturtiums give a garden an almost magical easy-care appeal. 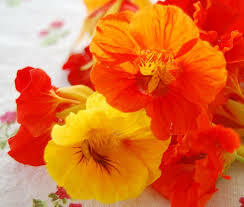 Nasturtium have over 80 species of annuals and perennials. They are easy-to-grow, whose leaves and flowers are both edible.These plants, with their bright greenery and vibrant flowers are good for either containers or ground covers. Their pretty fragrance also makes them a good choice for cut flowers....... bet you didn't think of that? With their large seeds and rapid growth habit these flowers are perfect to grow with children. They were the very first seeds my children planted - unfortunately they (the children) were so very, very diligent in their watering, the plot turned to mud. Not to be beaten by that minor setback, the kids used this area for their mud pie construction and 'who can get the most mud on them' play area. When their interest waned and they moved on to other exciting play activities, the area was left alone. Low and behold, the resilient Nasturtium seeds germinated, perhaps not as many as were planted, BUT! Just goes to show how nature will always endeavour to triumph over adversity - even my kids. Nasturtium come in the 'warm' colours of red, orange and yellow with some pretty salmon-pink and also creamy yellow flowers with orange centres. The foliage is a lovely bright green with some variegated varieties too. Nasturtiums bloom (and are at their best) during summer and autumn. Their appearance has variable foliage. They may be many lobed (example left), trifoliate or shield shaped and some are even tinted a blue-green. Plant directly either in full sun or partial shade (they bloom better in full sun) in moist, well-drained soil. The plants should appear in 7 to 10 days. Water regularly throughout the growing season (but not as much as my kids). If you are growing them in containers, they may need to be trimmed back occasionally over the growing season to keep them looking good. Nasturtiums are very easy to care for with the added bonus that they inhibit weed growth. If you don't like them in a particular position, it's an easy task to just pull them out. Drifts of nasturtiums planted in your garden are splendid for that special quiet morning walk where little droplets of dew sit suspended atop the leaves, just beautiful! For those of you who would really like to make full use of nasturtiums, please visit this link to find out how to make pickled nasturtiums seeds - now there's something really different!